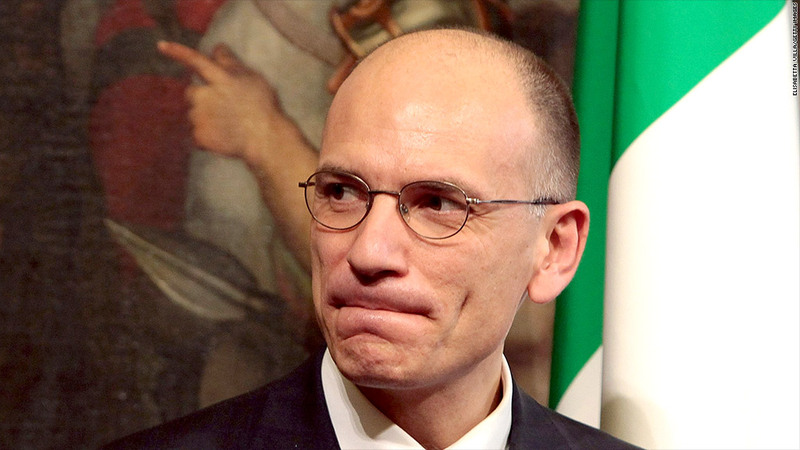 New Italian Prime Minister Enrico Letta wins investor approval but faces huge economic challenges. Investors sent yields on Italian bonds to their lowest levels in more than two years Monday as a new prime minister took office, pledging to stimulate the country's ailing economy without adding to its debt mountain. Center-left Prime Minister Enrico Letta was sworn in Sunday to head a broad coalition of ministers from his own party and members of Silvio Berlusconi's center-right party. In a speech to parliament Monday, Letta stressed the need to stimulate growth and create jobs, but said Italy couldn't borrow its way out of trouble. "After more than a decade without growth, we can't wait any longer for a policy of recovery," he said. "Without growth and without cohesion, Italy is lost." Letta's appointment ends two months of political stalemate and removes the prospect, for now at least, of a prolonged period of instability -- despite doubts about the coalition's durability and uncertainty over how it will achieve its economic goals. Italian markets rallied, with Milan's benchmark index gaining 2% and outperforming its European peers. The index has been the strongest of all major European markets over the past month, although it is still lagging so far this year. Italy also sold three billion euros in 10-year bonds at a yield of 3.94%, down from nearly 4.7% a month ago and their lowest level since October 2010. Bonds in weaker eurozone states have been rallying for months, supported by the European Central Bank's backstop pledge last year and hyper-loose monetary policy in Japan and the United States, which has prompted investors to look for higher returns elsewhere. "Italian sovereign debt is benefiting from the effects of central bank liquidity support and political stability of sorts," said Nicholas Spiro, managing director of Spiro Sovereign Strategy. The eurozone's third-biggest economy was brought to the brink of collapse in late 2011 when yields on its huge debt pile climbed to unsustainable levels around 7%. Tax increases and spending cuts by a technocrat government led by Mario Monti reassured investors. But they led to a backlash against austerity in February's elections, boosting support for comedian Beppe Grillo's protest movement and leaving no party able to form a government on its own. Letta wants to adjust Italy's unpopular austerity drive, and Berlusconi has campaigned for a tax on property to be reversed, but it is unclear how the new government would make up for the revenue shortfall and the backdrop continues to deteriorate. "Post-crisis sentiment toward Italy has never been better, but the economic conditions have never been worse," said Spiro. Government borrowing totals about two trillion euros, equal to around 127% of gross domestic product, a ratio surpassed in the eurozone only by Greece. The economy hasn't grown for years, unemployment is near 12% and rising, and living standards for many are tumbling. Letta said he would cut some taxes on the young and new employees, reform the property tax, and cancel a planned increase in the value-added tax, acknowledging that easing the austerity drive without piling on more debt would be a challenge. "While the latest news is positive for markets, the task of the new prime minister won't be an easy one," noted UniCredit economist Loredana Federico. The priorities for Letta's government mirror those of 87-year old Italian President Giorgio Napolitano, who was persuaded to accept a second term after parliament failed to agree on an alternative. Napolitano established two expert committees to work on overhauling Italy's convoluted electoral system and political institutions, and making structural reforms to restore competitiveness, boost growth and make a dent in the debt mountain.